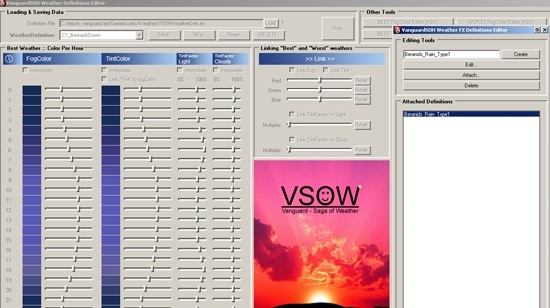 This tool is an extension to Vanguard Weather, written by my good friend Martin Karlsson. I worked with Shaun Showers to implement his weather fx functionality within our Maya tools. The premise is that each weather definition can have any number of weather FX definitions, a collection of emitters, attached to it. The biggest challenge was to cross reference everything when a user decides to delete one of these. I wanted the files to stay clean so I spent a lot of time to work out options for removing all connections or only to the current weather definition. 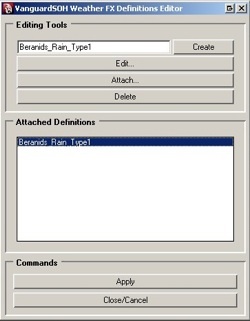 The attach… command would analyze which were the unique, pre-existing, weather FX definitions for the weather definition and bring up an extension window with only these displayed. In the next level of the tool, where the user edited a particular weather FX definition, the same holds true for checking connections of every emitter file present. If the user decided to delete an emitter form a weather FX definition, I had to check what other definitions had the emitter assigned and give the user the option to disconnect all of them. The functionality that Shaun implemented for the weather FX system gave Vanguard amazing visual capabilities, that we only scratched the surface of.